Following the analysis of several options for deposit opening and deep level development, ALROSA has laid out plans regarding restoration or full closure of the currently suspended Mir underground mine in the Far East of Russia. 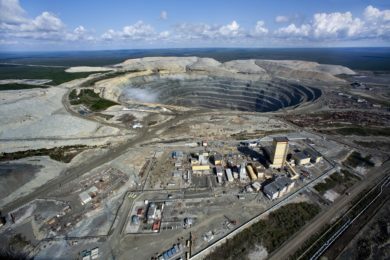 ALROSA said the concept requires deep level exploration down to -1,300 m to confirm the mine’s reserves. These activities are scheduled to be completed by early 2022. Budgeted at around RUB2 billion ($31 million), this work is included in the group’s RUB28.7 billion capital expenditure programme for 2019. Last year, the company suspended the construction of deep mine levels below the level -800 m where it was necessary to carry out works to prevent gas-dynamic phenomena recorded there, ALROSA said. Based on the results of the exploration works, pilot holes will be drilled to start preparation of deposit opening design documents (within one to two years). This work is to be completed before 2024. “Simultaneously, the company will carry out conceptual design activities to ensure water disposal at the mine and choose the best mining technology as well as ventilation and gas safety options,” ALROSA said. If it is decided that the restoration of the Mir underground mine is feasible, the construction is estimated to take six to eight years. “In summary, Mir mine restoration can start no earlier than 2024 and only if the studies yield positive results, and if it is confirmed that construction and mining can be done with the highest level of occupational safety,” ALROSA said.